My dad had us over for a BBQ on the 4th of July. My mother is visiting my sister, so this week has been an eye-opener in terms of how my dad would function without her. Let’s just say I’d fear for his intestinal tract. Is there even one complete meal in there? I asked if he might want to add a fruit or vegetable to the list. He laughed and shrugged off that crazy idea. When we showed up on the 4th, the only item he had to serve was the steaks. Enormous steaks. If I hadn’t brought vegetables and a side dish, I’m not sure he would’ve cared or noticed. After dinner he saw me eating a cookie, and asked why I was eating bread. At that point we discovered his error, and it was the first time my daughter saw me laugh so hard I cried. She was very confused by this phenomenon. Sometimes I think if I were a male I would have followed in my dad’s dietary footsteps. I can’t argue with anything he had on his grocery list (except the scotch – my choice would’ve been vodka). And I admit that going over on the 4th, a part of me was pleased knowing there would be some salty crap to eat. However I have learned that if I want to be able to move, poop or find any enjoyment in life, I need to balance it out a bit and ingest other items as well. But it doesn’t come naturally. In fact this may be why grocery shopping is so hard for me. If I went with my instincts, I’d clear out the Pringles supply and eat half of them before I was home. 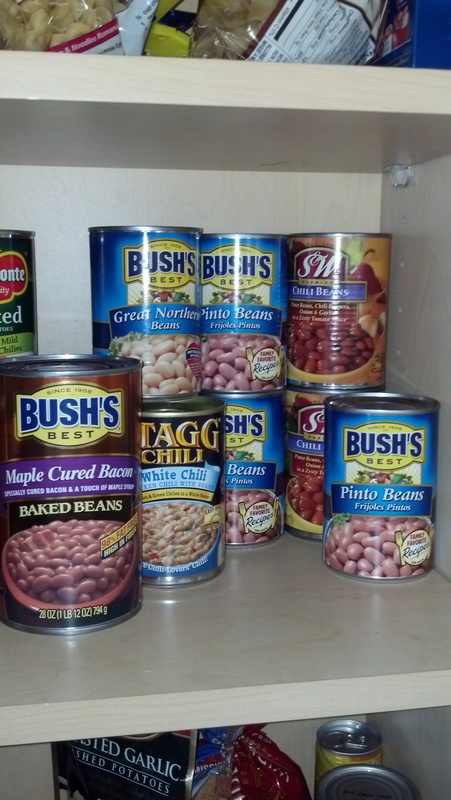 Nine cans of beans. Nine. Was this his lunch & dinner menu for the week?? Thankfully I took him out, had him over, and brought him a few meals this week. My mother returns tomorrow, and I’d say she owes me one.